Although I felt overwhelming joy at the Silver Room Block Party, there were elements of the crowd—as there are at almost all such events—that made me feel uncomfortable. The Silver Room Block Party is safe from the hyper-criminalization that comes with being Black—there are no CPD officers patrolling, like there are at many summer festivals in Chicago—but, like most parties, it is not necessarily safe for the bodies of Black women. Things can become dangerous when you combine liquor, hot weather, and men who may have been conditioned to touch without enthusiastic consent. I felt many hands brush my body and grab my waist, trying to coerce me to give them my number. The crowd was loud, so some men would get closer than necessary and press their bodies to mine. I felt their beards graze my shoulder. Another man grabbed my elbow to try to stop me. I communicated that I wasn’t interested and he drunkenly followed me. I think the most confusing tactic was when a Black security guard tried to shoot his shot. He said, “Come here bald head, I want your number.” I half-jokingly responded, “That line has been used so much tonight. You niggas have no creativity.” His response was, “How about give me your number or I’m gonna tase you.” I didn’t really know how to respond. I was shocked that he thought lightly threatening violence would make me laugh or give him my number. I gave an eye roll and moved through the crowd to escape his gaze. I went home pretty pissed. I know the intent wasn’t to make me feel frustrated or disrespected, but that was the impact. What they interpreted as harmless flirting was actually received as creepy men trying to wear down my patience until I just caved and gave them something. I wonder how other women and femmes felt. The questions I left with: Whose job is it to hold these folks accountable for this unwanted touch? Where can people who are too intoxicated to consent go to gather themselves? The Silver Room Block Party is clearly not alone in its shortfalls in addressing safety for women beyond having police or security presence. The culture of many public spaces has communicated that safety has a direct connection to policing and punishment, but doesn’t pay nearly as much attention to preventative procedures that can serve to intervene before anything even happens. However, there is a growing set of folks actively doing work to reimagine what safety and security looks like. Recently, groups like Party Noire, AMFM, and others like communications strategist and author Essence McDowell have started having conversations about what safety looks like in spaces where people—Black men and masculine folks in particular—can be held accountable without calling the police. The #MeToo movement has propelled conversation around sexual assault. But we haven’t had much of conversation about what accountability looks like outside of indictments and, most importantly, what prevention looks like. From large festivals like Pitchfork to smaller community house parties, I have seldom seen a way to take a quick break without paying for an extra tent space. Usually people are at the mercy of other intoxicated people at the party. I can think of a billion things that can happen because of your phone dying, or because there’s no safe place to sit for someone who drank a little too much. As a prison abolitionist, I’ve tried to imagine what safe social spaces for all Black people could look like in practice. The first step is addressing that actually spaces we imagine to be safe must constantly evolve as we listen to what those in our community need. 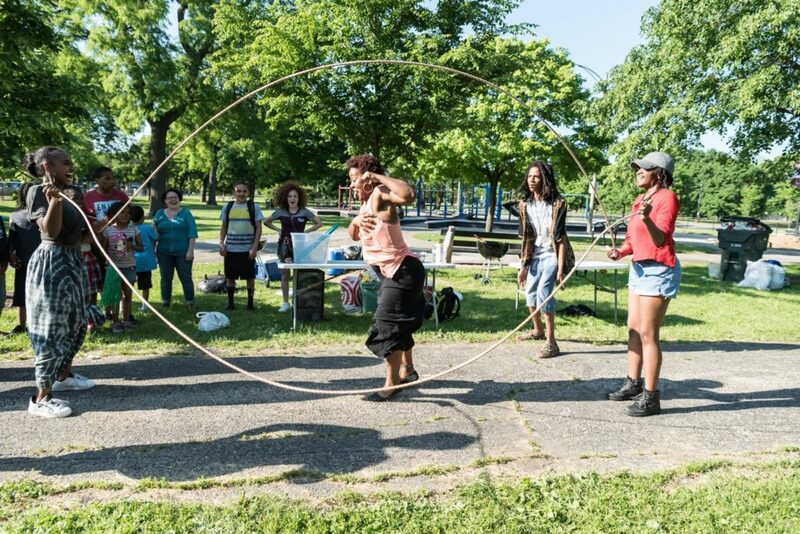 The Silver Room Block Party provides jump ropes for intergenerational double dutch, to build community and invite people to jump in. In the same way, we need to think about how we could intentionally provide tools for vulnerable people to feel safe. I spoke with Eric Williams, the founder of The Silver Room, and he mentioned that this is something he thinks about every year. “When we first started it was a family type of event but as we got bigger we started to evolve and add more resources based on feedback we received.” As the Silver Room Block Party grew, organizers started adding things like free HIV and AIDS testing, mental wellness resources, and violence prevention guides. After hearing my critiques in this article he was saddened by my experience, but was glad to hear the feedback and was interested in finding innovative ways to address safety at the next block party and throughout the year. This is by no means an indictment of the Silver Room Block Party. In truth, The Silver Room is much more ahead of the game than most places that have made it their business to create safe spaces for Black bodies, and I was so glad to be able to witness free Black joy. This is simply another nudge to space curators to talk more about these issues. After speaking with Eric, I’m confident that he will use this feedback in the same way he has in the past and I’m glad that he is a part of the change in re-imagining community spaces. Lastly, shout out to Eric for winning the First Annual Economic Impact Award for the Silver Room Block Party from the Downtown Hyde Park SSA, which was just announced. They deserve it! It is my hope that they will continue to raise the bar about what Black joy and safety can look like in Chicago. Trina Trill, otherwise known as Trina Reynolds-Tyler is an organizer with the Black Youth Project 100 and is a Data Researcher at the Invisible Institute. You can find them combating respectability politics, playing spades at the BBQ, in the classroom at the University of Chicago Harris School of Public Policy, or working at the Silver Room.